I visited Otranto Cathedral in late October 2011 with my younger sister Kate, while researching places on our route for my book “Crab’s Odyssey“ on sailing adventures in Greece, Italy and Turkey. Sure enough, there behind the altar in the Cathedral crypt were impressive glass cupboards against the walls, and, in them, rows and rows of skulls, plus a mixture of bones. It was eerie to be back again in the presence of so many skulls, their huge eye-sockets fixed on us. The skulls belong to the Martyrs of Otranto from the siege of 1480. When the Ottomans broke into the City they massacred 813 citizens who refused to convert to Islam – these were canonized in 2013 by Pope Francis. 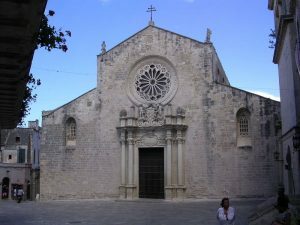 The cathedral had been founded in 1068 by Norman bishop William/Guglielmo and is dedicated to the Annunciation of the Virgin Mary and consecrated in 1088. The medieval mosaic floor had survived, because antiquarian enthusiasts in the 18th century had collected enough money to have it restored. 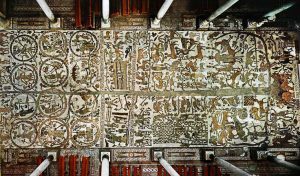 It is fascinating – the entire floor of the three-part nave was decorated with a mosaic of the Tree of Life with three separate trunks. It was a kind of visual Who’s Who of the medieval world. We found again the elephants and a giraffe, and classical heroes such as Atlas with the world on his shoulder. Near the top, hidden among the Tree of Life’s twigs, I found again King Arthur. He was on a horse, waving uncertainly – as if trying to hitch a lift on a different animal that would know its way back to the North, as Kate put it. The mosaic is 12th century, and commissioned by Gionata, the first Latin archbishop in Otranto. It was created by a young monk called Pantaleone in 1165. The only fresco wall painting, saved from the Turkish destruction of 1480, is of the Mother and Child and Byzantine. After the Cathedral we went back to the harbour. When we had reached Otranto the day before, moored against the breakwater near the entrance to the harbour lay a gleaming three-masted sailing yacht. Apparently she had just arrived from Malta – she was an American charter boat sailing the Mediterranean. When we returned she was gone. We talked with a young man on the harbour-front about the fishing boats and he said only about 20 remained. Not many go on working through October, he explained. At the best of times they catch only small fish. It was five years or more since a swordfish had been caught in those waters: “It has been a bad year – only very small yachts and very big yachts. This year the Middle Class seems to have disappeared”. Is sailing the Mediterranean Greece and Italy declining? All the craft in the harbour were small – I counted 40 masts, but there were only 5 small fishing boats still in the water, their blue nets neatly rolled on the quay alongside them. This was in late October. These fishing-boats that braved the Adriatic were simple open boats still hardly bigger than Crab, but each of them had its own design of deck-house, serving the purpose of providing somewhere dry in bad weather. All five carried home-made radar-reflectors that were very bulky – clearly there was now an outsize fear of being run down in the night by some unwieldy passenger-ship. For more on this amazing Cathedral, read Lonely Planet or Wikipedia.